We have been doing a lot of grilling this week. The temperatures climbed quite high in the beginning of the week making any sort of cooking in the kitchen completely miserable. Today is pleasantly cool which is a relief because I'm spending the entire day working on recipes for project I'm doing with United Noodles in Minneapolis. Lots of Japanese food happening today! But before I delve into a day of recipe testing, I want to share this perfect 4th of July recipe with you. It's really two recipes in one so it's twice as nice! If you're grilling this weekend, you're going to want this all purpose dry rub recipe that works for more than just pork loin chops. 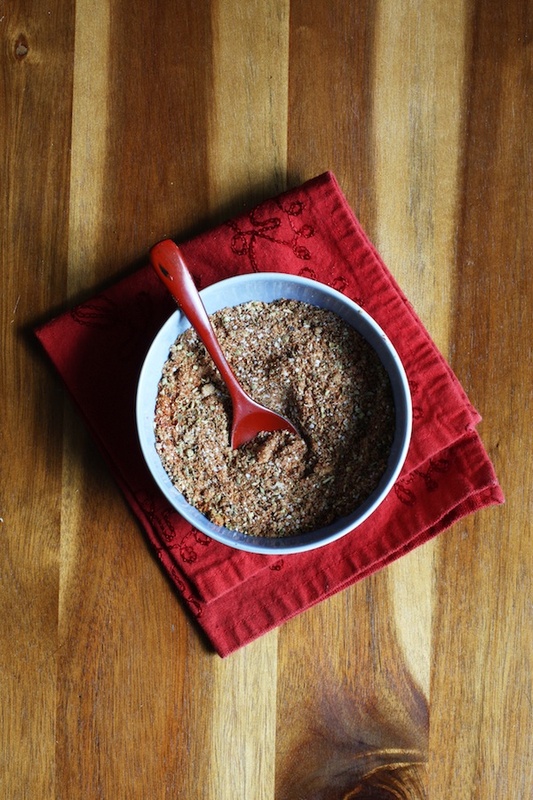 From fish and chicken to pork and beef you'll be rubbing everything with this flavorful, easy rub that you can make with spices from your pantry. I started making this rub a few years ago. Initially we only used it on chicken drumsticks but I quickly found that it tasted great on just about anything. You can also vary the recipe depending on your taste preferences. More heat? Add a little more chili powder. Smokier flavor? Add more cumin and use smoked paprika instead of regular. My favorite dried herb to use is oregano but you could easily substitute anything from dried thyme to basil or even rosemary. Then you just mix it all together and store it in an airtight container to use as you please! Let's talk about pork chops for a minute. I tend to shy away from cooking pork chops just because they tend to dry out and have a flavor slightly resembling cardboard. Are you a little skiddish around pork chops too? Please tell me I'm not the only one. Luckily I have some good news: pork chops can be juicy, delicious and flavorful! There are two important steps to making a perfect grilled pork chop: 1) BRINE. Do not, under any circumstance, skip this step. It adds flavor and helps the chop retain its juices during grilling. 2) DRY RUB. Yep. That layer of flavorful seasoning is crucial and helps create a flavorful crust and locks in and enhances all that tasty pork flavor. I used boneless pork loin chops here but you could do this with bone-in pork chops as well. I made some simple cornbread muffins (from a box...gasp!) and a simple salad of sliced cucumbers, tomatoes, and a vibrant vinaigrette made with plenty of fresh basil, dill and lemon thyme. Oh, and lots of feta. Don't forget the feta. Alright, enough talking. On to the recipe! If not using right away, transfer to an airtight container and store in a cool place (the fridge is great) for up to 3 months. Fill a large bowl with 2 quarts water. Add the salt and sugar and stir until dissolved. Place the pork loin chops in the bowl and let sit for 1 hour at room temperature. 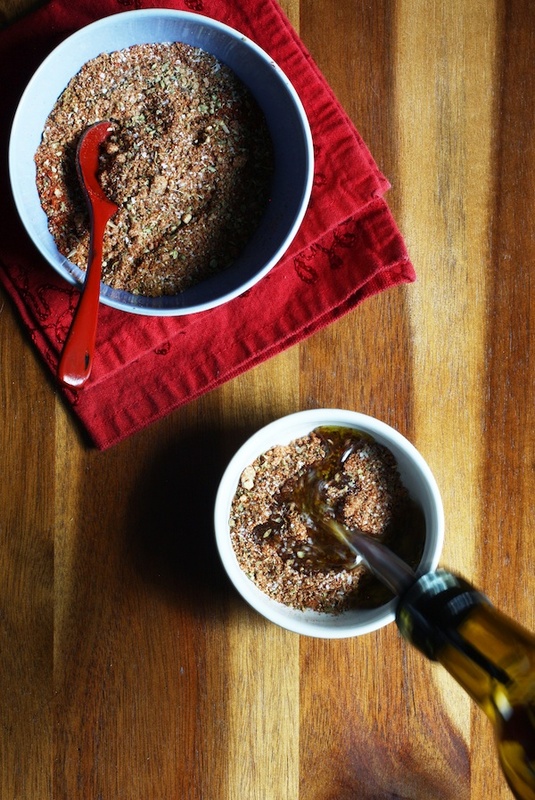 Put 2 tablespoons of the dry rub in a small bowl with the 1 tablespoon olive oil. Use your fingers to massage the rub all over the pork loin chops. It may not seem like enough but a little goes a long way! Preheat a charcoal or gas grill to medium-high heat. If using charcoal, put your coals on one side of the grill leaving the other half as your cool side. If using gas, only light one side of the grill. While the grill preheats, make a tin foil tent large enough to cover the pork chops. Alternatively, you can use a roasting pan. Place the pork loin chops directly over the heat source on your grill. Grill for about 3-4 minutes per side or until you see nice grill marks. Move the chops to the cool side of the grill and cover with your foil tent. Allow the chops to cook for 10-15 minutes or until an instant read thermometer reads at least 145 degrees Fahrenheit. Serve with a fresh veggie salad and cornbread!